Rachel holds a PhD from the University of York, UK. 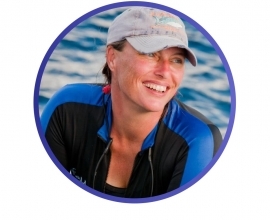 For nearly two decades, she has worked with fishers and partners in several countries to identify threats, research needs and conservation opportunities for threatened marine wildlife and their critical habitats. In 2014, Dr Rachel founded the international NGO MarAlliance to promote impactful and inclusive grassroots science and conservation of marine wildlife. The Sharks International Conference is the first truly international event devoted to elasmobranchs, with its first two editions being held respectively in Cairns, Australia in 2010 and Durban, South Africa in 2014. The next edition in João Pessoa, joined by the Brazilian Society for the Study of Elasmobranchs (SBEEL), the American Elasmobranch Society (AES) and the Squalus Foundation from Colombia, will be even more outstanding. Av. Alm. Tamandaré, 229 - Tambaú, 58039-010. João Pessoa, PB - Brazil.